Android OS is known for its customization ability. Name the feature and you can customize it on your Android device as you want. Be it themes, launchers, wallpapers or widgets you can personalize it endlessly. Well, the same power of Android customization is available on Wear OS as well. Besides changing the watchstrap you can customize watch face according to your wish. 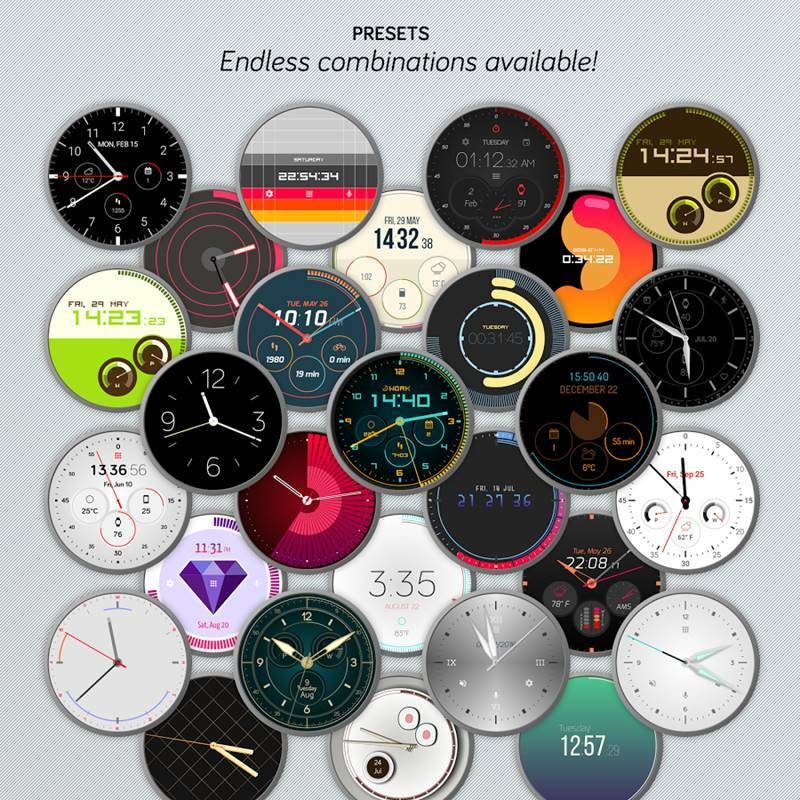 There is no dearth of cool watch faces on the Google Play Store as Google Play Store has plenty of them. 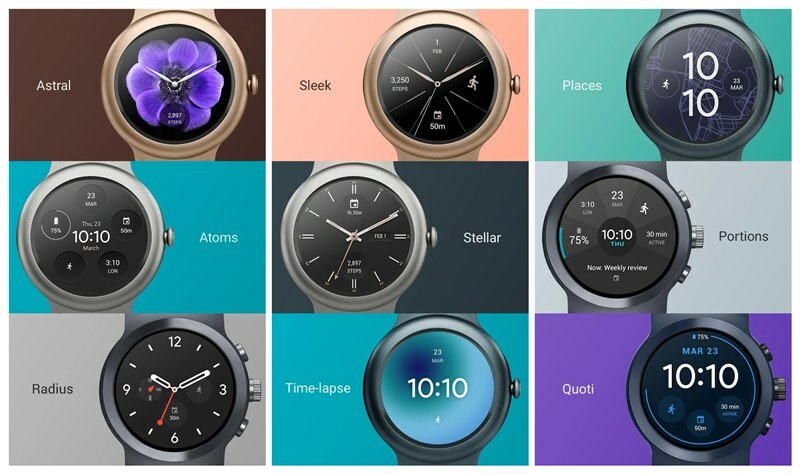 Moreover, Google Play Store has a separate page for Wear OS watch faces that lists all the watch faces. Don’t worry, you don’t have to scroll through each and every watch face on the Play Store to find the best one. We have done that work for you. With simple and minimalistic design in coordination with Google’s material design, Timr app flaunts 11 colors and 3 background colors. Other than the time and date, Timr doesn’t display anything. The animated scale present at the bottom indicates seconds. Are you a fan of an analog watch? Then Weareal. Realistic Watch Faces is for you. With 5 different types of watch faces under its banner viz. Rider, Airpower, Golder, Acute and wonderland, each watch face is extraordinary in its own way. While Rider and Airpower models display current temperature (°C/°F) and battery level, the Airpower mode also displays Google Fit steps counter. Besides that, the app gives you the ability to preview the watch face. 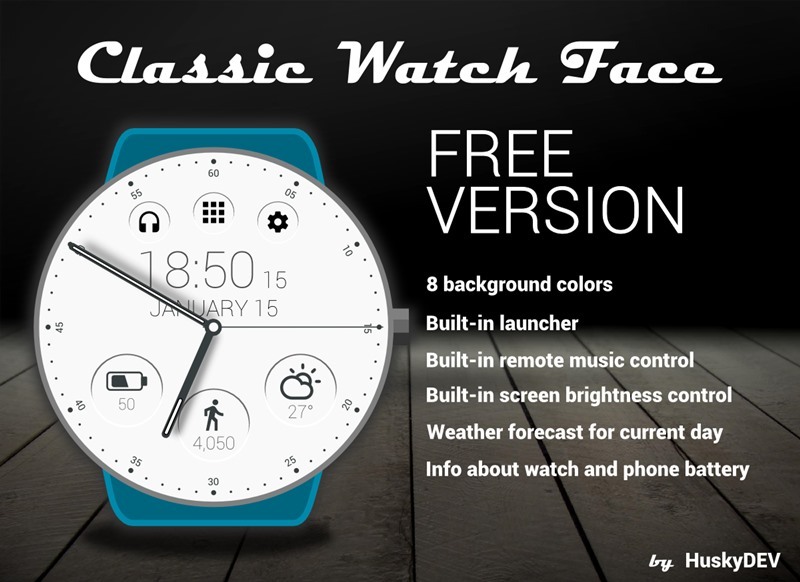 Neo watch face is an interactive watch face that shows both digital and analog time. While the free version is limited to features such as weather, battery indicator, background colors, and 24hr time format, the premium version flaunts 3 days weather forecast, Google FIT step counter, Music player, shortcuts for apps (such as Hangouts, Google Keep, Google Maps, Alarm clock) and animation besides other cool features. With 8 interactive areas and 13 different styles to choose from, Chrono Watch Face also lets you define a secondary time zone for digital display. The watch face other than showing the usual time and date, shows watch battery, mobile battery, weather, step count, unread SMS, missed call and unread email from Gmail. 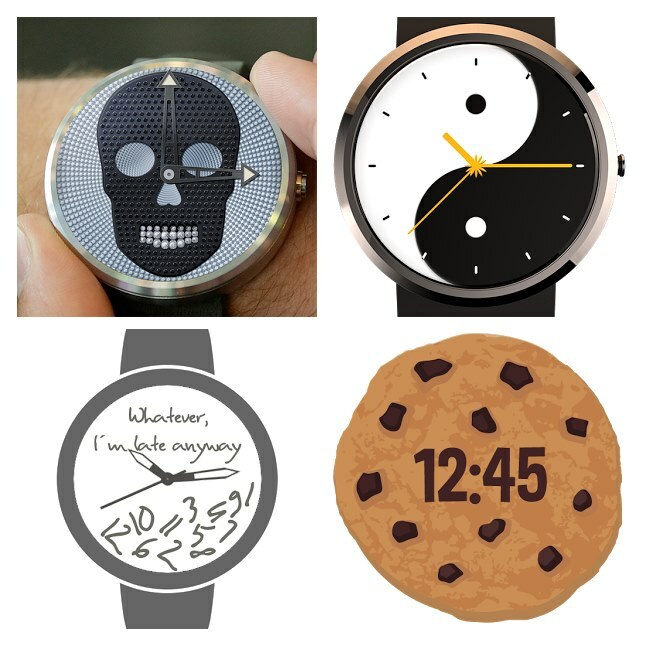 WatchMaker Watch Faces is a curated community that grants you access to tons of watch faces. 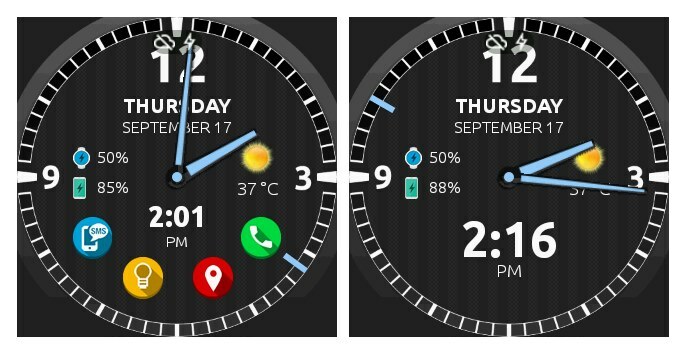 The app besides providing you with appealing watch faces also lets you build your own watch face. With powerful editing tools and real time preview of edits, WatchMaker is a must try watch face app for your Wear OS. As the name suggests, Classic Watch Face has a pure Classic look. While there is a premium version, the free app also provides extended features such as eight background colors, music control, weather forecast, Google Fit data, watch battery, phone battery and the ability to change screen brightness. 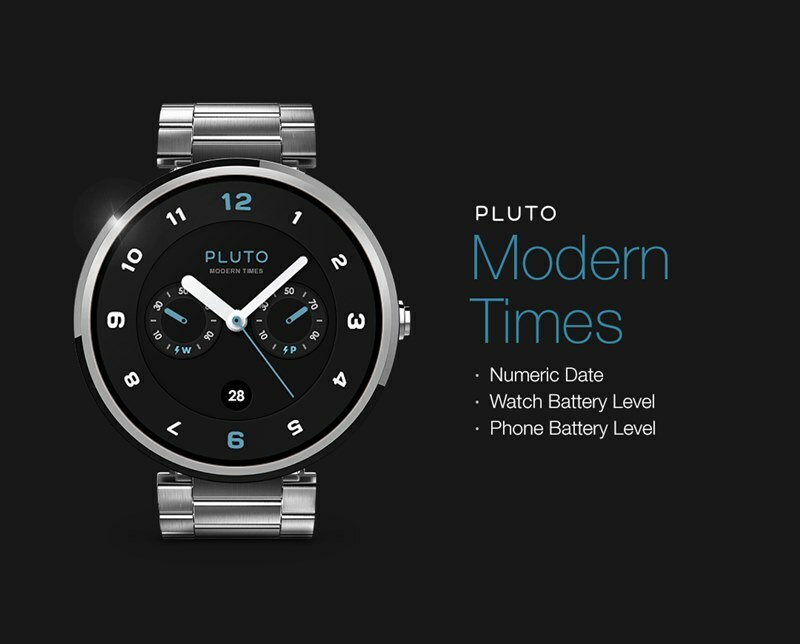 With a huge number of settings available in Pujie Black, you can customize the Watch Face as you want. Pujie Black includes the digital and analog hybrid watch face and provides information such as watch battery status, local weather information, your calendar events and your fitness data besides the usual time and date. You can also assign interactive actions to various taps. The name is kind of confusing, as the app besides showing weather on the watch, also presents step count, location and next calendar event. Other than that, it also shows watch battery and phone battery. 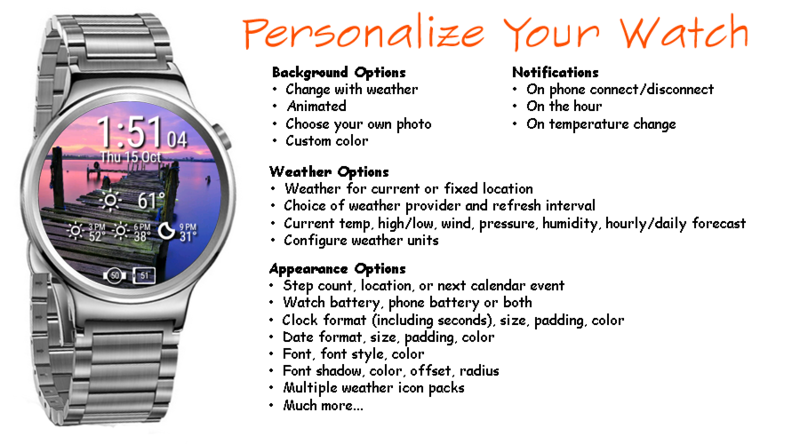 Coming to the USP of the Watch face, it provides weather from 3 different weather providers. Further, it gives various other customization options such as background color, foreground colors etc. Colorful icons packed with dark background make this watch face an appealing choice. The app provides features such as weather, battery indicator (watch and battery), 24 hour format and screen time. It also comes in premium version that offers interactive menu, Music Player, Google Fit data and 5 days weather forecast among various other cool features. With a clean, classy and elegant look, Modern Times watch face is a well thought out watch face for Wear OS. It supports both round and square display. The pleasing design is accompanied with a customizable ambient mode, numeric date, watch battery level, and phone battery level. 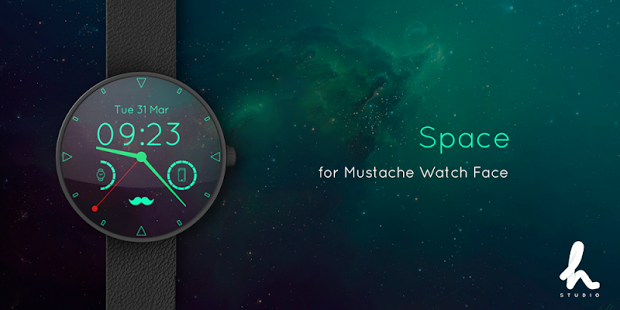 Whether you like analog or digital clock, Mustache Watch Face offers both. Plus you get a cool and stylish mustache icon as well. While the free mode offers light and dark theme only, Premium mode offers 12 premium themes. The other free features include notifications in ambient mode, translucent notifications, Phone battery level, Watch battery level and mute mode. Check out: How to scan documents using Android phone and store them online for easy access. The Premium mode offers interactive display with weather and fitness data and supports tap to launch apps among other things. Definitely worth the money as the LED watch face offers abundant information in dot matrix style. Although the prime focus is on weather data, it offers other information such as step counter, phone battery, and watch battery. In the weather department, it presents information such as temperature, sunrise and sunset, pressure, humidity, Wind Speed & Direction. Less is more is the perfect way to describe this cute watch face. With minimal design, the watch face is available in both light and dark versions. While the minutes and hours are written digitally, seconds are shown as a series/ring of dots. Whether you like a clean interface or information rich watch face, or little bit of both, Looks watch face offers everything. It includes nine watch faces under its banner viz. Astral, atoms, radius, portions, places, quoti, sleek and stellar. 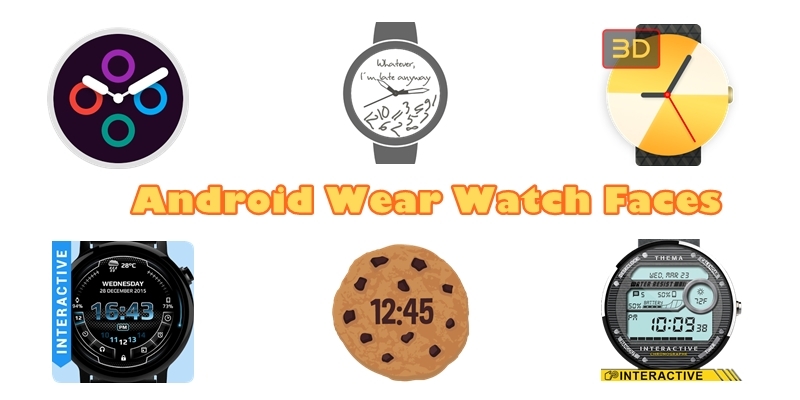 Google Play Store also provides many graphic based watch faces. These watch faces are designed for both circular and square screens and give your watch a unique cool. Check out: High battery usage by Android? Here’s how to fix it.